As snow's piled up around North Central Massachusetts, some residents have found a good reason to be pleased with winter conditions: power outages have been only a minor inconvenience. That's something many local businesses and residents have not taken for granted since the ice storm that hit the region in December 2008. In the Massachusetts communities served by New Hampshire-based electric and gas company Unitil — Ashby, Fitchburg, Lunenburg and Townsend — some lost power for more than a week. Cathy Clark, a Lunenburg resident who has been on the forefront of the local outcry against the utility, said that merely hearing a generator come on can spark bad memories. "I think the memory of the ice storm is etched on people's minds in a permanent fashion," she said. Over the past five years, Unitil and some local customers say, the utility has made big strides in its responses to storms. But another complaint about the company remains: Its rates are significantly higher than those of other Massachusetts electric companies. And the cost of improving its storm response is only adding to that issue. David Tall, general manager of Alpha Rho Inc., a Fitchburg maker of plastic boxes, said the company made it through 10 days without electricity five years ago thanks in large part to a fellow Fitchburg manufacturer. Rocheleau Tool & Die Co. invited Alpha Rho to its warm, lighted factory. "They were gracious enough to give us some space to use so we could continue an assembly operation there," Tall said. "That's how we carried on for 10 days." Tall said the company hasn't experienced anything approaching that kind of hassle since. He said his only beef with Unitil these days is about money. Like many big consumers of electricity, Alpha Rho buys its power from a third-party supplier, but it still pays transmission costs and other fees to Unitil for the use of its grid, and those costs are particularly high in the Fitchburg area. John Harden, economic development specialist at the North Central Massachusetts Chamber of Commerce, said Unitil seems to be making a real effort to address customers' concerns. "My understanding is they've done very well in terms of their response to recent storms," he said. The company has worked to put better response systems in place and has been "very active" in clearing trees to reduce damage to electric lines, he said. Harden said Unitil has also worked with businesses to mitigate high power bills, helping Simonds International, a cutting tool manufacturer, install cogeneration power plants, and assisting the chamber with a plan to let local companies benefit from a solar power facility in Lunenburg. But he said the higher cost of electricity is still unavoidable for most area businesses. 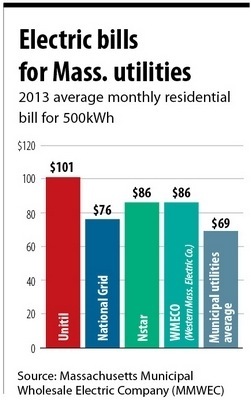 For a typical home using 500 kilowatt hours in a month, a bill from National Grid comes to $76, according to figures compiled by the Massachusetts Municipal Wholesale Electric Co., which provides support for independent, local municipal utilities. For NStar customers, the average cost is $86, while municipal utilities on average charge only $69. For Unitil customers, the average is $101. Unitil spokesman Alec O'Meara said the chief driver of the higher rates goes back to Massachusetts' electricity deregulation in the late 1990s, when utilities with generation assets had to sell them. Unitil owned long-term energy contracts that were classified as generation assets, and their sale created a cost for the company that has been part of customers' bills, through something known as a "transition rate," ever since. The transition rate is set to disappear at the start of next year, but won't come as an unmitigated relief to ratepayers. Unitil plans to establish a reserve fund to pay for costs from major storms in the future, bringing in $2.8 million a year. The company has also proposed a rate hike starting June 1 that would increase revenues from its Massachusetts electricity business 11.5 percent. Part of that will pay the $5.3 million it racked up responding to three major storms since the December 2008 storm. Meanwhile, Unitil continues to face the wrath of some residents more than five years after the ice storm. Worcester Superior Court rejected class-action status for a suit against the utility, but the plaintiffs, including Clark, the Lunenburg resident, have appealed. The state Supreme Judicial Court is set to hear the case early this month.